February 7th, I attended the DOAG Dev Camp 2017 in Hannover, Germany. The DevCamp is held in a ‘Bar Camp’ format, meaning that everybody can bring proposals for sessions at the day the bar camp takes place. The proposals are rated at the beginning and the auditorium can decide if they want to discuss the proposal or not. I pitched a session on the ‘Cost of the Oracle Cloud’ which was accepted by the other attendees. 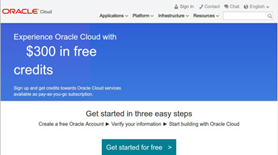 At the begin of the week (around 5th of February) Oracle changed the pricing of the Oracle Cloud Trials. Before this week you could get a trail which lasted one month, now you get a credit of 300$ which you can spend on Oracles Cloud offerings in one month. Once the 300$ are gone or the month is over you get a mail asking if you like to continue to use the cloud services which are then charged on your credit card. Yes, you have to give a valid credit card if you sign up for a trail. The card is not charged until you say so, accepting the continuation of the services. Gone are the time when you could request another trail account using a different mail address (not that anybody did such a bad thing). Anyway, I stumbled over this change when I look at the cloud.oracle.com page in preparation of the session I planned for the DevCamp. Well, you see that you get 300$ to spend on the cloud trail, but not how much a specific trail costs. From my experience with the cloud I know that you need DB Cloud, Storage Cloud, Compute Cloud and Java Cloud to get a Java Development environment for ADF in the cloud. Are the 300$ enough to get all those services for a decent amount of time? Read the complete article here.